Art shouldn't have to be a luxury, so Community Engagement, a local nonprofit organization in partnership with Grand Central Art Center, has gathered some of Orange County's best artists to bring engaging and collaborative “social practice” art to underrepresented communities in SanTana. 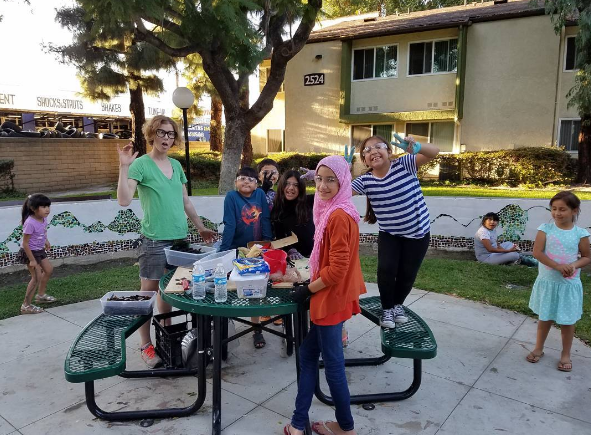 Each artist in residence implements “social practice” art which means the community's art workshops are more socially engaging rather than instructional. “When I was thinking of social practices, it could be so simple as just me spending time with them, and that's the change,” says Trinh Mai, a classically trained painter who now works in mixed media installations. Mai brings her knowledge of art history to explore weekly themes with residents of Heninger Village, a low-income community for seniors. Many Heninger Village residents expressed that art was never something they thought they'd ever excel in. 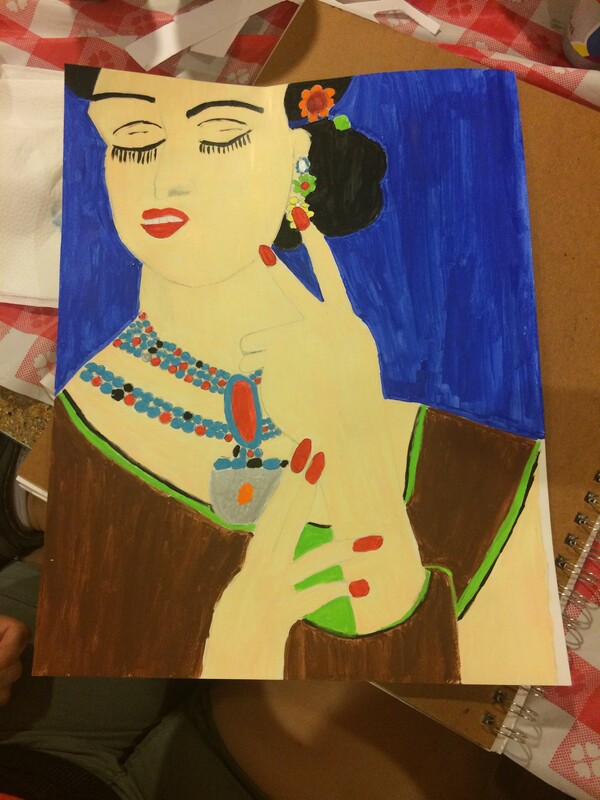 “I've learned that I do know how to paint,” says Maria Cupa, a resident of Heninger Village, “I never tried before.” Cupa says as she adds some finishing touches to her vividly colorful self-portrait reminiscent of a Frida Kahlo painting. While Mai noticed that some Heninger Village residents initially lacked enough confidence to pick up a paint brush, Dino Perez, a SanTana native son and fixture in the city's art scene, discovered that the kids at his residence in the Triada community never realized being an artist was a viable occupation. “It's also about closing the opportunity gap,” Preboski says as she notes that extra-curricular art activities are now more of a parental responsibility rather than a school one, which leaves children of low-income families deprived of the arts. 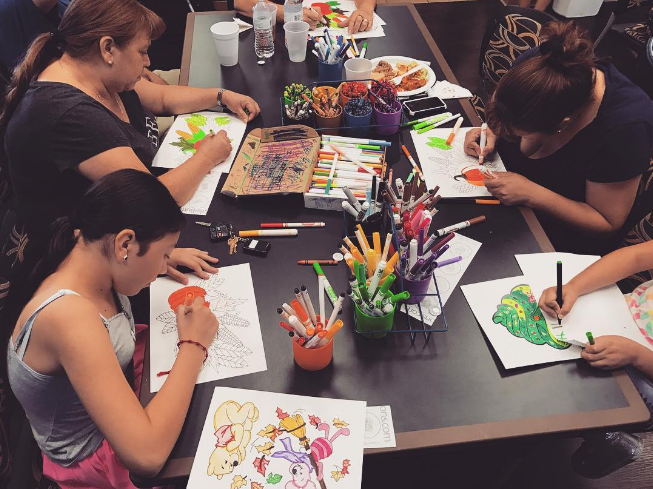 Perez's project, called Coloring With The Community (which has expanded to include the patrons on Scoops Ice Cream and Maz Café Con Leche), has him designing coloring sheets for Triada children and parents to fill in. Popular design requests among Triada kids have included Kylie Jenner, the Virgin of Guadalupe, and Shopkins. A simple activity such as coloring brings some refreshing and youthful innocence to a community that has faced some dark times recently. Angel, a 16-year-old resident of the Triada community and a regular at the Coloring With The Community events says, “everyone gets to know each other,” and that coloring offers him a break from his cell phone. Judith, who is 11-years-old and sat by Angel, shared that she's recently thought about becoming an artist. Not all Community Engagement sites involve conventional art. The longest standing and largest site in Warwick Square hosts a thriving community garden. Angelica Gomez and Joseph Linnert are the leading green thumbs at Warwick Square which grows native and edible plants. Preboski says this residency pushes “gardening as an outlet and as an art.” Meanwhile, in the diverse community of Sullivan Manor, a glass artist named Rebecca Chernow is building an intricate community mosaic with the help of parents and children. For more information visit www.communityengagement.org. Community Engagement will have a fundraising mixer tonight at AKORN, 305 W. 4 St., Santa Ana, register for the event here. If you can't make it out tonight, you can still click here to donate to Community Engagement.